Back round to that time of year again, cheapest I have seen them, low power consumption. so it doesn't work then? Otherwise how can it not be worth a £1. Last year I bought 2 sets of LED units that clip under the hood of a hat for use hillwalking at night (gets dark real early in Scotland in the winter) - they work perfectly in all weathers and at a pound a throw outstanding value! got to be worth it, even as a shed or garage light or whatever. useful to have a couple for emergencies too. Awesome!!! Gonna get some for my car boot... would you believe a £15k 2007 Civic S Type doesnt have a light in the boot! One of those things that always has a 'pointless' use! And for a quid, c'mon! I got some - very bright - great for in cupboards and the loft. Pretty cool collection of equipment. Can't go wrong with any of them at that price point. I'll be grabbing a camping mat and the 24 LED lamp. I got three off Ebay last year for about a fiver each inc postage. One was bright enough to light up our tent whilst camping and the batteries lasted about 30 hours or so. For a quid these lights are outstanding. Voted hot!. You'd be lucky to buy 24 white LEDs on their own for a pound let alone a fully working 24 LED camping light!. I used a 1 LED lantern I got out of TK-max for camping last year (3 day trip) and it was bright enough to illuminate my whole tent + the original batteries are still going strong. I'll be buying a couple of these for this years travels :thumbsup:. At a pound how can anyone possibly complain??. Quick question, what batteries do the lamps take? 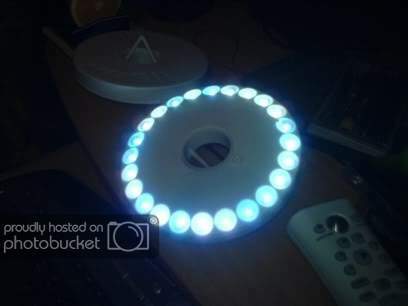 The ones we have which are virtually the same but have two circles of LED's take normal AA batteries and yes you can use rechargable ones. £1 for 4 pack at poundland but you'd be better off with NiMh 1700 + ones. Obviously can't be 100% sure Poundlands are the same AA batteries but they all look like they are made at the same factory. Best check though before buying batteries !! These things are excellent, they really do a good job of lighting a tent. At £1 I would buy a couple of spares but sadly no pound land anywhere near me. These guys really should get into web retailing. I hate poundland - they never put prices on anything! Voted hot - as a deal its good, and even if its cheap they have always exchanged stuff that doesnt work! 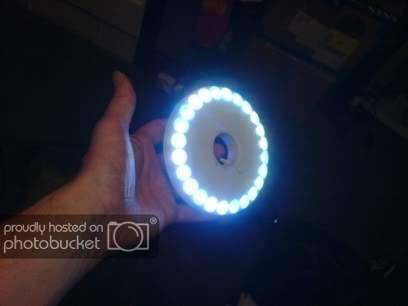 Wilkinsons normally stock the 2 ring version for around 3 quid - worth considering as it gives you the option of running less LEDs to save the batteries. Either way, top gadget for camping or after dark garden activities which need a more widespread light than a torch - I found it handy for battening up fences in the recent gales! Awesome!!! Gonna get some for my car boot... would you believe a £15k … Awesome!!! Gonna get some for my car boot... would you believe a £15k 2007 Civic S Type doesnt have a light in the boot! Wow, are you Tim Westwood? Got 2 of these today and I'm very impressed at how powerful they are!. One is enough to illuminate an entire room :-D. Bigger than I imagined too. I'm going to go back and get a few more tomorrow, well worth a quid!. These will be great for music festivals and general camping this summer :thumbsup:. I've got some 2500mAh rechargeable batteries (x4) in them and will test the time it takes them to completely discharge tonight. Also should mention Poundland have dynamo/battery powered combo LED torches for a quid too.